“To William Emerson belongs a different priority. His home was the old manse immortalized by Hawthorne which still stands just across a narrow field from Concord Bridge. On the morning of the battle he encouraged the troops and cared for women and children who had fled from their homes. That evening he wrote a vivid account of the day’s events, implying by his use of pronouns that he was with the alarm company which prepared to defend the town after the Minute Men had advanced toward Lexington and that he retreated across the river when the British appeared in force and was with the party which made the final advance to and across the bridge. This supposition is in harmony with a tradition that he appeared that morning with a firelock in his hands and encouraged one timid man by placing a hand on his shoulder and saying, “Don’t be afraid, Harry; God is on our side.” However, some writers believe that he was at his house during the fight at the bridge. “These facts and the record of his ministrations to the troops at a muster in the preceding month make it seem quite probable that he was recognized as the chaplain of the local militia in the informal way which was common at the time. This gives plausibility to the statement that he was the first chaplain to serve in the Revolution. Two future chaplains were active that day but both as fighting men. Emerson was in the camp at Charlestown for a time that summer and the next year was chaplain of the troops at Ticonderoga for some months. “Becoming ill with a disease that threatened to grow worse, he started for home but could go no farther than Gookins Falls on Otter Creek near Rutland, Vt. Here he died in the home of the local minister. 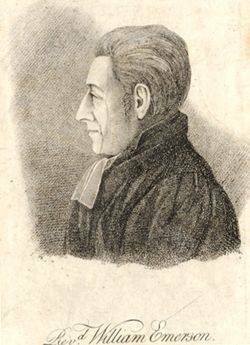 He was a son of the Joseph Emerson who was a chaplain at Louis-I bourg in 1745. Ralph Waldo, the best known of the Emersons, was his grandson. From the U.S. Army Chaplain Corps Facebook page.